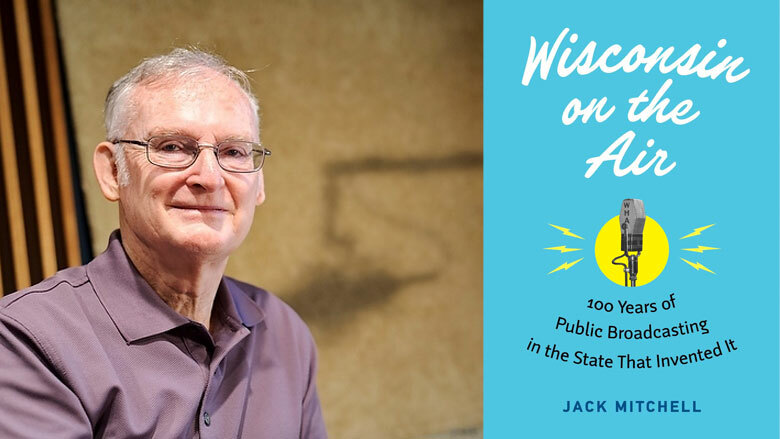 In a political season rife with hyperbole, posturing, half-truths, intolerance, and worse, author and UW–Madison Professor of Journalism and Mass Communication Jack Mitchell reminds us that there is a media outlet where intelligent debate and public discussion are still valued. In Mitchell’s Wisconsin on the Air: 100 Years of Public Broadcasting in the State That Invented It, we learn that public broadcasting’s founders sought to cultivate an informed, enlightened citizenry, a sense of community, even a sense of fun through educational broadcasting that was and is today available for free to all. Full disclosure: I worked for Wisconsin Public Radio from 1971 to 1983. Back then, it was WHA-AM and WERN-FM (the latter an acronym for the Wisconsin Educational Radio Network). Mitchell, a broadcast pioneer who helped develop National Public Radio’s flagship news program, All Things Considered, was my boss from 1976, when he became manager of radio, until I left WPR for a career at CBS News. One shouldn’t conclude that Mitchell’s Wisconsin on the Air is only for past and present employees of public broadcasting, or just for its audience. The book is actually a must-read for anyone who cares about democracy, even though it may at times seem a trifle involved or deep “in the weeds” of the organization’s complex history. Mitchell describes how public radio started at UW–Madison in 1917 with federally-licensed experimental “station” 9XM, a project of the Physics Department. Its first transmission—the sound of a popular tune of the day, “Narcissus”—was emitted from a lab in Science Hall to an off-campus receiver. Officially licensed in 1922 as WHA, 9XM may not be (as the author claims) the oldest continuously broadcasting station in the nation. But perhaps more important, Mitchell argues, is that Wisconsin was the first state to apply a public service philosophy to government-sponsored broadcasting: 9XM was based on the concept that education can improve lives beyond the classroom—the Wisconsin Idea transmitted across the airwaves. In 1967, this Wisconsin tradition found expression in the nation’s Public Broadcasting Act, which established and made available funds for the Corporation for Public Broadcasting and, eventually, the Public Broadcasting Service and National Public Radio. Mitchell guides readers through a century of development and change, touching on the transition from “educational” to “public” broadcasting and exploring that strange new animal, television, and the challenges of highly competitive digital media. There are generous descriptions of decades of radio and TV programming: live broadcasts of Badger athletic events; “School of the Air” lessons for kids (Wisconsin was a national leader in instructional programs) and Bob Homme’s children’s program The Friendly Giant (which transitioned in the 1950s from radio to WHA-TV); Chapter A Day literary readings (begun in 1927 and still popular today); the late Karl Schmidt’s radio drama project, Earplay; extensive news coverage alongside documentaries, such as Wisconsin Public Television’s We the People, Wisconsin, which set a standard for “civic journalism”; and WPT’s more recent efforts in community engagement. Mitchell explains how hard it was to turn a hodgepodge of regional radio stations featuring the same programming into the Wisconsin Public Radio network, offering two distinct, theme-based “channels”: one with classical music and NPR news and another featuring locally-generated “ideas” or “talk” shows. He gives vivid descriptions of extended battles (particularly between UW–Extension and the Educational Communications Board) for dominance, some won, some lost, some simply a draw. Mitchell concedes that in a world full of choices, some programs might be considered less public service than entertainment. He even raises the question of whether these programs are worthy of taxpayer support. But, in their defense, he comes back to the Wisconsin Idea in public broadcasting, the “very public expression of objectivity, fairness, balance, and context in the search for truth.” It’s hard to argue with that. Journalist and poet Ronnie Hess began her broadcasting career at Wisconsin Public Radio. In the 1980s, she was a reporter/producer for CBS News in Paris, before returning to public radio in the Twin Cities and Chicago.